What are geostatistical interpolation techniques? Geostatistics, in its original usage, referred to statistics of the earth, such as in geography and geology. Now, geostatistics is widely used in many fields and comprises a branch of spatial statistics. Originally, in spatial statistics, geostatistics was synonymous with kriging, which is a statistical version of interpolation. The current definition has widened to not only include kriging but also many other interpolation techniques including the deterministic methods discussed in Deterministic methods for spatial interpolation. Geostatistical Analyst is a realization of this wider definition of geostatistics. One of the essential features of geostatistics is that the phenomenon being studied takes values (not necessarily measured) everywhere within your study area, for example, the amount of nitrogen in a field or the concentration of ozone in the atmosphere. It is important to identify the types of data that can be analyzed appropriately using geostatistics. Think of the following rectangle as your study area of interest. 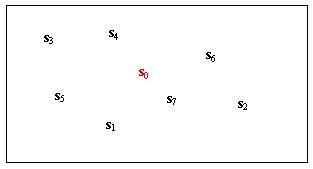 Spatial locations within the study area are indexed by the letters si, where each particular location is indexed by the subscript i. In the above example, suppose you have collected data at locations s1 through s7, and you want to predict the value at location s0, colored in red. This is an example of interpolation. Kriging assumes that you could put s0 anywhere in the study area, and you assume that there is some real value at location s0. For example, if the data consists of the concentration of nitrogen s1, ..., s7, there is also some concentration at s0 that you have not observed but would like to predict. Notice that the data is collected as point events, but values actually occur everywhere, so they're called spatially continuous. The word continuous can cause some confusion. If the data is spatially continuous and continuous in value with a multivariate normal distribution, and if you know the autocorrelation of the multivariate distribution, then kriging is an optimal predictor. However, different forms of kriging have been developed to accommodate all the types of data above.